We’re thrilled to introduce you to the winners of the HCI Human Capital M-Prize on Leadership. For many years, HUL (Hindustan Unilever Ltd.) has sent young managers to spend 8 weeks or more, living in a remote rural village in India as part of its entry-level leadership training bootcamp. Not only do they develop a more intimate understanding of the rural consumer, they also become humane leaders through transformative experiences in these villages. Hindustan Unilever Limited (HUL) is one of India's largest fast moving consumer goods companies and is owned by the European company Unilever, which owns a 52% majority stake. HUL began its operations as Lever Brothers in India in the summer of 1888, when crates full of Sunlight soap bars, embossed with the words 'Made in England by Lever Brothers' were shipped to the Kolkata harbour and it began an era of marketing branded fast moving consumer goods (FMCG) in India. HUL was formed in 1933 as Lever Brothers India Limited and came into being in 1956 as Hindustan Lever Limited through a merger of Lever Brothers, Hindustan Vanaspati Mfg. Co. Ltd. and United Traders Ltd. It is headquartered in Mumbai, India with an employee strength of over 15,000 and contributes to indirect employment of over 52,000 people. 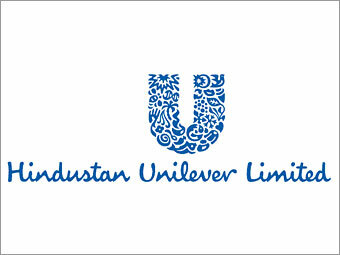 In June 2007, the company was renamed “Hindustan Unilever Limited”. Hindustan Unilever's distribution covers over 1 million retail outlets across India directly and its products are available in over 10 million outlets in the country making it a distribution behemoth in a country with fragmented retail trade. Two out of every three Indians use its many home and personal care products, food and beverages. HUL is the market leader in Indian consumer products with a presence in over 20 consumer categories such as soaps, tea, detergents and shampoos amongst others with over 700 million Indian consumers using its products. In 2007, Hindustan Unilever was rated as the most respected company in India for the past 25 years by Businessworld, one of India’s leading business magazines. The rating was based on a compilation of the magazine's annual survey of India’s most reputed companies over the past 25 years. HUL was one of the eight Indian companies to be featured on the Forbes list of World’s Most Reputed companies in 2007. Leena Nair, Executive Director at Hindustan Unilever says, "The Rural Stint is an integral part of a manager's development program. By sending young managers to spend time in Indian villages, we are sensitising them to the ground realities that many of them never get a feel of while growing up in large cities. The experiences they have in these villages stay with them through their careers and this has gone a long way in making them more human managers. The Rural Stint has been a part of the management training program for over 30 years now and certainly has a role to play in the quality of leadership HUL has consistently produced over the years." At the time Unilever began undertaking a process called 'Isation' or 'Indianization' of the managerial cadre, there was a shortage of Indian managerial talent that could readily take over from the European managers that were running the Indian business at the time. The solution arrived at, was to hire raw Indian talent and invest in training them over a two-year period, at the end of which, they would be ready to assume line management responsibility. With India having gained her independence, expatriate managers were reluctant to spend long periods of time in an increasingly nationalistic climate. A large number of expatriated managers were keen to return to England now that the Empire was history. In order for there to be continuity of business Unilever needed to quickly build a pipeline of talent to fill up these vacancies that were coming up at an alarming pace. The Management Training Program (subsequently rechristened the Business Leadership Training Program and now the Unilever Future Leadership Program) began with its first batch of 20 Indian recruits way back about the time the II World War was drawing to a close. Some left because the post-war scenario offered better opportunities and others because they did not fit in, and the Company let them go. While the former couldn't be tackled in the short term, it was felt that a 24-month boot camp might help new recruits find their feet in the Company, making 'fit' less of an issue. There was also the issue of a majority of the recruit's education having been completed overseas resulting in a very poor understanding of the Indian diaspora. For a Company which at that time sold hydrogenated vegetable oil under the brand name of Dalda in the iconic green and yellow packaging, a deep understanding of the Indian culture and its consumers was essential in order to conduct business effectively. This issue it was felt, could be resolved by immersing young managers in a truly rural experience in an Indian village. 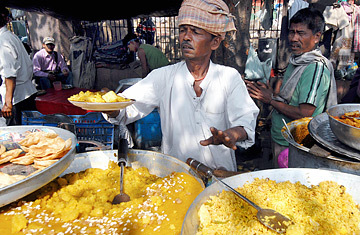 When it was first conceived, managers spent as many as 6 months in rural India going from village to village demonstrating the efficacy of Dalda and getting villagers to consume Indian delicacies cooked in the Ghee substitute. (Ghee is a traditional Indian clarified butter, used for cooking) At the end of this immersion, the manager would have an intimacy with the Indian ethos, customs and leadership perspective that would run deep and stay with him through his career in the Company. The introduction of a rural assignment was met with resistance initially. Both by sections of the management as well as the young recruits. Some senior managers were of the view that the Company didn't have the luxury of putting new recruits through such a lengthy training, and that a long rural assignment was a 'luxury they could not afford' at the time. Young recruits who had been educated overseas hadn't expected to find they would be walking the streets of villages selling Dalda to the wholesale trade in Indian villages. Trainees were required to travel extensively through the hottest months and the Indian monsoons, that brought with it a plethora of water-borne diseases. Trainees were required to get a battery of inoculations before they headed out on this excursion. For 6 long months they shared the life of a travelling salesman, staying in the same lodges, eating the same food, drinking the same suspiciously colored liquids that traders offered them in the market. In the post war-era, it became a regular practice for a large number of trainees to be recruited at the start of the year in pretty much the same fashion that colleges took in students. While initially the size of intake for the training program would be as few as 5 or 6, in the 90's the Company would be taking in batches of 60! The key implementation challenges were largely organizational. The Company was going through a tumultuous change in the context of a much larger political change in India and often there were disagreements on any course of action. A long exposure of trainees to rural India was a hotly debated subject, given that a few trainees dropped out of this rigorous exercise. It was argued that there was no need to put young managers through a survival test so early in their careers, given that they were ultimately to sit out of the regional offices and do sales and marketing. Geoffrey Heyworth, the Unilever chairman at the time was keen to change the Company into a true multi-national firm and to that end strongly favored delegation. In order to achieve this vision, it was necessary to have all overseas units manned by executives, carefully selected, trained and groomed, who must ultimately be nationals of the country. Many senior Lever leaders at the time however doubted if it would ever be possible. There were many limitations to be overcome, beginning with the medium of instruction in schools and ending with the gaps that no amount of training can bridge. Previous attempts to overcome these barriers hadn't worked and there was a deep-seated cynicism in the few Indian managers in the organization. Heyworth, keen to make a strong point, began calling Indian managers to forums in the UK and the annual conferences for the top managers across the globe. His endorsement of the training program for young managers meant that every one had to toe the line. The time young managers spend in rural markets transform their perspectives on leadership and management in many ways that can't really be measured. 1. By living with rural consumers, young managers acquired an intimate understanding of their consumption habits and culture. This would help them many years later when launching new products and campaigns. 2. In participating in socially relevant projects, they were able to understand the gravity of their situation and act with responsibility when in positions of power later in their careers. 3. In living in the same conditions as the poorest sections of society, they would acquire a sense of meaning in the work they were doing. These experiences not only nurture compassionate leaders, they also generate a lot of goodwill for the Company. Over a long period of time the results are plain for all to see. In 2007, Hindustan Unilever was rated as the most respected company in India for the past 25 years by Businessworld, one of India’s leading business magazines. The rating was based on a compilation of the magazine's annual survey of India’s most reputed companies over the past 25 years. HUL was one of the eight Indian companies to be featured on the Forbes list of World’s Most Reputed companies in 2007. HUL is the most innovative company in India by the Forbes 2011 list and 6th in the top 10 list of most innovative companies in the world. HUL's leadership-building potential was recognized when it was ranked 4th in the Hewitt Global Leadership Survey 2007 with only GE, P&G and Nokia ranking ahead of HUL in the ability to produce leaders with such regularity. Most recently Fortune named Hindustan Unilever as the #6 company globally for Leaders saying the $4.1 billion company sends young managers to live in villages so that they can understand the needs of rural consumers. In the words of some of the recent participants, the program has left a lasting impact on their young impressionable minds and imparted lessons that they have carried through their careers. Reproduced below are some of their views and opinions on the rural program. Being a woman, I was initially quite skeptical about going to a rural village. However, 5 years on I remember it as one of the most treasured and enriching experiences of my professional career. The stint made me see the human side of a corporate, one as large as HUL. I was in an HUL factory in a small town. The factory had undertaken several projects for villages around it to help them build a sustainable livelihood. One such project was the women empowerment project. In my stint I also worked with some NGOs who worked towards starting cottage industries to be run by village women. These industries would capitalize on the strengths of these women - making traditional Indian condiments or food, sewing, handicrafts etc. Women formed self-help groups with the guidance of these NGOs and were able to draw a regular income. The NGOs guided them with the procurement of raw material and sales of the product in the market. The HUL factory would regularly monitor the financial health of these groups. Some self help groups supplied material to the HUL factory itself. Trainees were regularly a part of these projects. Such initiatives made me realize that being a large corporate comes with added social responsibility. I have very fond memories of my own Rural Stint. From visiting an orphanage to play with the kids to winning idli (an Indian breakfast rice cake popular in South India) eating competitions, it was one amazing journey. The most striking thing about living in Rural India is the simplicity of the lives of people there. It's been said so often it appears clichéd, but then it hits you very powerfully when you are there. 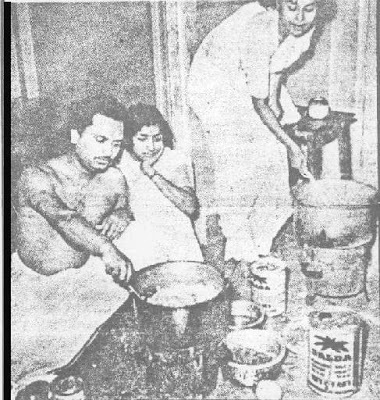 Wake up, work hard, exchange opinions about the happenings in the newspaper, drink lots of coffee/tea/coconut water/sugarcane juice, catch up on the events in the houses of everybody you know (with or without their consent!) & then a bit of TV & off to sleep! It teaches you that the more complex life seems, the simpler the answers are, if you can find them. I remember the time I was in Khamgaon in rural Maharashtra. Since most of the work for the actual project happened in the morning, we were left to our own devices in the afternoon. So a couple of colleagues and I started going to the village school to teach. I was very surprised to see a top-of-the-line computer in what was essentially a 2-room school. The computer wasn't working because a couple of wires had not been plugged in correctly, which I rectified. Thanks to this the school teachers decided to anoint me the 'computer expert' and asked me to take classes for the kids. My colleagues and I were very skeptical about the whole thing, given that these were kids who were probably 9-10 years old and could barely speak a word of English. Once we gave it a shot, we were we pleasantly surprised. The kids picked up the nuances really rapidly and by the time my stint was ending they had understood how to use MSpaint, open files, save files etc. One thing that this taught me very clearly, was that as a leader, the worst thing to do is to be intellectually arrogant and underestimate your own team's or your people's potential. If a below-average teacher facing a language barrier like me was able to impart some computer skills to these kids, I am certain that with better access and coaching they could really have gone places. This one realization was totally worth the month of staying in Khamgaon (besides the great food that our host gave us). I stayed in a remote village called Parkhed in Maharashtra, and lived in a hut for 6 weeks and ate the food the grandmom of the house cooked on an open fire. My projects were to teach English at the government school, and to increase the productivity of agriculture in the village by coming up with ideas on how HUL can help make irrigation and water conservation techniques better. What the rural stint taught me was how 65% of India was actually living. Trainees like me are typically from large urban cities, and we picture an India in our heads that constitutes only 25-35% of reality. During my rural stint, the first feeling that occured to me was this feeling of being humbled. Spending time with those people in the village gave me a different perspective on life. The people there have more aspirations than an average urban citizen. The amount of work those people involved in agriculture did was a true learning, because we are all from a protected environment, while for them every day is a challenge. Overall I feel the Rural stint made me a better person, a better leader and marketing professional and gave me a good knowledge of the country we live in and the consumers and customers we cater to as a company. 1. The greatest leadership lessons are imparted by having people stand up and lead in real life situations. Throw three or four young managers into a remote village and charge them with a challenging task and you will be surprised with what they come up with. 2. Leadership training is most effective when you start early. It is when a manager begins his career that he / she is most open to ideas and receptive to challenge. Later on, people are largely closed to new ideas and have their comfort zones in terms of leadership styles. 3. Insights that fuel innovation are only generated when there is real intimacy with the consumer. By living with consumers, the quality of insights one can access is of a different order altogether. 4. A first hand experience of how a company's products can transform the lives of people goes a long way in imparting meaning to what a young manager is doing. There is a new purpose to the work they are committing themselves to. Companies looking to replicate this model should desist from measuring the impact of these kinds of innovations. Benefits accrue over many years in situations when least expected them. One of the most commonly heard phrases at HUL is 'When I was in my rural stint...' That just goes to show that the experience stays with managers through the entire duration of their careers and the insights they gather in that time help them find new solutions right through their careers. Allen Sequeira, Executive Vice President - Group HR and Leadership Development, Mahindra group commenting on the program says, "The HUL Rural Immersion Scheme has been a benchmark for Industry for the past few decades since it was conceptualised and rolled out. In particular, the eight weeks spent on a rural stint with hands-on projects in Educating Poor Children, Women's Empowerment, Nutrition and Health, Community Initiatives etc have gone a long way in nurturing and grooming talent for Senior Managerial Roles in the future. Involvement in Community Projects especially for the poorest of the poor instills the values of Sharing, Empathy, Community Ethos, Sensitivity to the problems of the less fortunate, the importance of Team Work and Collaboration in Groups, dealing with Complexity and Ambiguity and utilisation of Resources in Resource Constrained Environment. Far and away, the key takeaway I presume for any Manager from this Programme would be coming to terms with the majority of the populace who live in rural areas in India and who are also our potential consumers and at the end of it all, making us all much more human and having meaning and purpose in our humdrum lives". The Mahindra Group whilst not adopting the Model in toto have made a significant beginning in having a Rural Immersion Programme for the Group Management Cadre for a few days with a few key strategic objectives outlined above and the HUL Scheme has certainly been one of our benchmarks, amongst others. They missed out on a lot of talented women though, the question at the interview for management graduates,if you are a girl was "are you going to get married?" To the best of my knowledge a question like this is NEVER asked at a HUL recruitment interview. In fact it is a strictly avoided question. Having worked at HUL for over 10 years I can assure you that some of the processes that HUL has in place for its women employees are world class. If indeed you were at the receiving end of this question it was a grievous error on the part of the interviewer. When someone gets married is a personal choice, and has on bearing on the outcome of an interview at HUL. Thanks for writing in! Unlike most other stints in the BLT program at HUL, Rural stint is one that is largely experiential and not driven by learning objectives / projects to be completed in a stipulated period of time. I think somewhere thats the beauty of this stint. It is amazing how much people deliver in this stint despite not having a deadline or target to be chased. In many ways the rural stint is an eye opener, as corporate slaves we tend to drift away from the "real India". What was most striking to me was the twinkle in the eyes of several school students when we went for taking classes at the local village school. There was a mad rush as to which class will the "madam" teach in. I was expecting the kids to be rowdy, and unattentive, but they turned out to be just the opposite. The class was quiet through all the sessions I took and infact a number of students asked questions. It really did bring out their desire to learn. I ensured I went to the school whenever I had the time. The other wonderful experience was working with the women's self help group in the village. 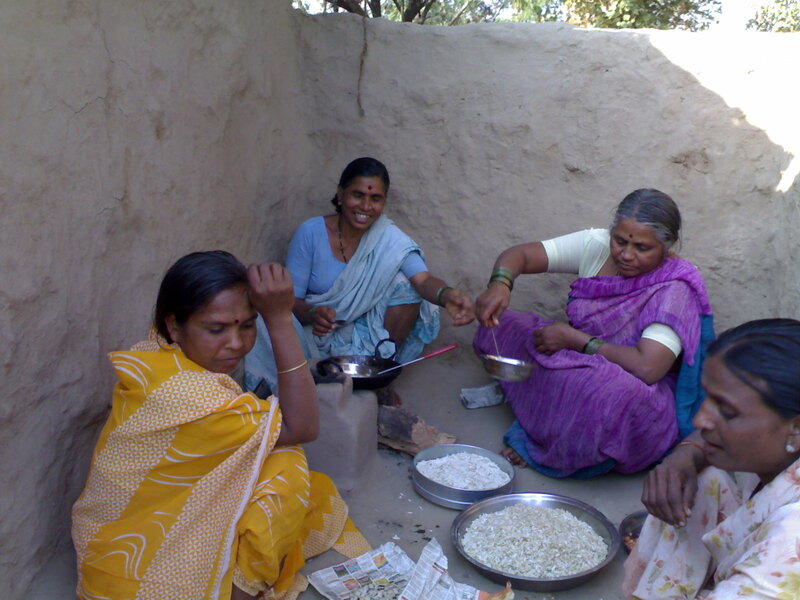 These women would use their free time in the evening to make papad, chiwada etc. We worked closely with them to understand how they were sourcing the raw material, and realized that they could reduce costs easily by procuring it from the wholesale market. We were able to build a model which reduced the costs of production significantly, thus bringing up their earnings. I also designed the packaging for the papad, and took some samples to the market and convinced some large retailers to keep stock of the papad on a pilot basis. While work on these projects was one thing, the entire interaction with all kinds of people in the village - the kids, the students, the ladies, the elders - made me realize how similar and yet how different we were. While there are 500 good things I can write about the stint, one thing I must mention is the food. A lady at the village would cook for us daily with farm fresh vegetables, treat us like her own children, and its one of the best food I have ever had, better than the many many 5 stars I have visited till date ! Absolutely shurti... I clearly re'r the days when kaku, our hostess in the village used to cook for us... It was simple food made with much intent and care... I always felt that the people in the village looked up to us to bring a positive change in their life! Thats the reason they always looked forward to trainess coming in. They were ever welcoming, accorded a lot of importance to our suggestions. During my rural stint I realised that our simple act of corporate service was just so important and essential for the villagers. It gave me a sense of touching the lives of people in the truest sense of the word and that is a very humbling experience. I want to thank you for your contribution to this discussion as well as for the material you have shared with me to improve my story! The point you make about service is a vital one. Most corporates could do well to serve the communities they operate in more meaningfully and consistently. I did not have the rural experience as per the typical definition, but ended up doing a lot of work in rural as part of my business development role in HUL. No amount of reading/documentaries prepared me for the reality assault in my first trip to a rural market in Maharashtra. Humbling would be an understatement; I was ashamed that I had taken the resources at my disposal for granted when there were students who walked 9 miles to school, come rain or shine, who aspired to be state toppers, civil servants, the like. I started appreciating small things in life, which actually made can make a HUGE difference to the life of another. We were looking at expanding Shakti to include the men of the household and I was initially skeptical about the value attached to the additional 500 rupees or so (about $10 a month). I could not have been more wrong. As a young mother put it, it would enable her to educate her daughter, empowering her to lead an independent life. Talking to students and the younger people there made me realize how much we have in common- same set of aspirations to make a better life for ourselves AND make a difference to things around us, the same fears and worries.. even the same enthusiasm for the next big movie release or India-Pak match! Sales as a process makes you feel good; my rural experience, however, took it to the next level and made me feel enriched as a professional and individual. Is there any specific experience that left a lasting impression on you as a leader? That shifted your leadership perspective? Thanks for sharing your personal experience during your rural immersion. There are several shades to the Rural story. As someone who had spent 2 years in rural, I shall try and share some insights. The naive and humble rural is all about unexplored geographies and markets willing to be taken on 'first covers the best' rule. So you find consumers living in a hutment or in a tiled house aspiring to try out 'Dove'- MRP blissfully ignored. The aspiration surprises anyone, for the same consumer pulls out her hard earned sweat laden money and buys the day's commodities which goes something like this:' 3 tomatoes, 2 onions Rs 5 for cooking oil and 50 gm dal.. enough to feed four mouths back home. One Shakti Amma based in a remote village near Warangal, aged around 40-unmarried as the MGM doctors had discovered a hole in her heart, is full of life and promptly sets up a HUL stall every fortnight in her village. The motivation? She needs to earn enough for her medicines for the day. She had followed this routine for 5 years before her sad demise in 2009. Every person who knew her in HUL wept. The other side of rural I witnessed was ugly. When I had once accompanied one Shakti Amma on home to home selling, she used to stand outside the closed wooden gates of ‘some homes’ and announce her arrival. The lady of the home -someone from the privileged upper caste stands inside the door indicates the requirement- lands the currency from some 3 feet high. The SE carefully places the stocks on the floor, leaves the change and turns back- all this without even a usual hand to hand or face contact!! It surprises and makes you cringe at this accepted social norm. I witnessed the unusual practices of some MF’s while extending loans. A rural Kirana shop owner borrows a sum of 1000/- pays up installments of 200/- PM and yet to have a closure on the loan after 7 months!!! Rural always is inspiring and thought provoking. It definitely makes one humble and sometimes makes you realize that these are our roots and this was where our grandparents would have begun life. When you work for HUL it provides with a passport to peek into the lives of rural populace, which otherwise could be a domain of NGOs. To this date the initiatives surrounding rural remains a passion for me. You make some valuable points about some of the experiences you have being 'ugly' ones. To my mind it is these kinds of experiences that leave the biggest impression on one's mind. At a young age, an experience like this can steel your resolve to make lasting social change happen later in your life. To commit to building a career based on social responsibility rather than personal greed. I distinctly remember my rural stint for a different and unexpected kind of challenge in our rural development initiative. In the area of watershed deveopment, our project was to document the positive impact of check dams on the groundwater levels and crop yields to make a strong case for expansion of the project to other villages.In our minds,the lasting images of the the reasons for the lack of development in rural India range from lack of central government funding,corruption at the many stages,charlatan MPs and MLAs,canniving bureaucrats,lack of awareness and aspiration, etc.That's what we think of whenever we are asked as to how to move the needle in rural India.But none of those reasons were preventing the village of Parkhed from taking the next step in watershed development. The government body that worked with HUL had a dedicated and tireless worker, who pretty much knew everything that was to be known technically. With HUL's involvement, there neither a lack of funding nor a lack of transparency in the same.As each batch of HUL BLTs would come with laptops and mobiles and blue tooth devices,this surely had to fire up the people's aspirations and their awareness on the outside world.So what was preventing the bunch of villagers in Parkhed from moving forward? In plain and simple terms, it was lack of trust of each other. The group of villagers in the lower part of the village believed that the check dams being built was only increasing the yield in the upper part of the village.Of course, this wasn't true entirely, but that was the perception. This led to many projects being delayed and even accusations of people delibreately damaging the check dams. This was an entirely human connundrum that could be(and eventually was) solved only by reducing the trust deficit. Much later on in my work in HUL, I was part of a team that was young, ambitious and incredibly talented. The only possible chink in our armour was our hyper competitive upbringing.We were lucky to have a line manager who recognized this early on,and worked solely on making us a a better team.As the walls we had erected between ourselves came down, and as we gave each other open feedback,we forged the partnership for being a very close knit team. The more I see bickering politicians in our assembly or the US senate or in Climate change talks in the world, the more I realize the issues that I first saw in my rural stint in Parkhed, were the same issues that was stopping the world from going forward.The rural stint helped me see this human fraility from close quarters,something that has played out pretty much across teams I have met in the corporate world or the spectrum of public policy across the world. This 'human frailty' that you talk about is a vital insight to carry with you through your career! Thanks for sharing this inspiring story about the check dams too. The eight weeks of rural exposure is very enriching and transforming experience for the young BLTs and goes a long way in making them effective leaders for future. It’s quite nostalgic as I look back and think about my rural stint/experience....21 years in HUL and yes those were the days we could not make this an exclusive "go to market" channel, due to issues like lack of awareness, affordability, infrastructure and approach, large number of villages were not having electricity etc.,. HLL, as it was those days invested disproportionately in to creating awareness and trial. I have had one such humble and insightful experience when I pioneered one of the seeding in operations called “Hybrid Van” to identify all the above 2K population villages in Tamil Nadu state and bring them under distribution coverage. The van used to get fully equipped with projector, generator, screen and other basic equipments required to film Super Star Rajni’s hit songs sandwiched with Rin, fair & lovely and clinic plus ads. The state ranked no. 2 in cinema viewing those days nationally and only source of media vehicle available along with Radio. While GPS is now available at every body’s finger tip on their mobile instrument…those days we used to spend hours with life size district maps to identify villages, routes and go for exploration next day. My team would start at 7am with packed water, lunch and dinner as you don’t find hygienic options in villages those days. It used to be 3 to 5hrs of very rough drive as most of the villages did not have “pucca” roads. The task for the first half of the day is to do a quick dip stick of potential, outlets available and making a viable plan for coverage and the second half of the day was to do demos of our fabric wash bars and shampoo on villagers to create awareness. The screening of the show would start as the evening approaches followed with a product stall and lucky draw to lure rural consumers and generate trials. In three years we could saturate the coverage of >2K villages in south. It is very difficult to pen down some of the humbling and emotional moments. From poorest of the people offering their food to people showering their respect and affection unconditionally, it’s been a transforming experience. Post which I was part of the team rolling out rural initiative and micro credit project called shakthi as trade marketing manager and regional sales manager for rural south driving direct coverage plan and enhancing the Shakthi model. Will need time and space to be able to share every learning moment. Every stint has developed my ability to understand emphathise, adapt and adjust and in the process has made me a better human and effective manager. You make some very pertinent points about the evolution of Rural India and the impression it has made on your development as a manager and leader through the years. 21 is a lot of experience! I particularly liked your observation about people sharing despite their poverty. It is a very valuable lesson for a young manager who can easily get caught up in their little selfish world rather than look to make an impact on society. Thanks very much for this perspective. Stephen Thank you for opening a window onto a very different world. It is interesting to read of the resistance to changing one's mindset and the benefits of the 'immersion' experience which delegates later identified. Thanks Troy. The story you tell about your experience in Iraq is truly wonderful and inspiring! I remember the time I was in Khamgaon in rural Maharashtra. Since most of the work for the actual project happened in the morning, we were left to our own devices in the afternoon. So a couple of colleagues and I started going to the village school to teach. I was very surprised to see a top of the line computer in what was essentially a 2 room school. The computer wasn't working because a couple of wires had not been plugged in correctly which I rectified. Thanks to this the school teachers decided to anoint me the "computer expert" and asked me to take classes for the kids. My colleagues and I were very sceptical about the whole thing given that these were kids who were probably 9-10 years old and could barely speak a word of English and had what we felt a reasonably limited world view. However, once we gave it a shot we were as shocked as the Hole in a wall project guys. The kids picked up the nuances really really rapidly and by the time my stint was ending they had understood how to use MSpaint, open files, save files etc. One thing this taught me very clearly was that as a leader the worst thing to do is to be intellectually arrogant and underestimate your own team's or your people's potential. If a below average teacher facing a language barrier like me was able to impart some computer skills to these kids I am certain that with better access and coaching they could really have gone places. This one realization was totally worth the month of staying in Khamgaon (besides the great food that our host gave). I have very fond memories of my own Rural Stint. From visiting an orphanage to play with the kids to winning Idly eating competitions, it was one amazing journey. Being a woman, was initially quite skeptical of going to a rural village. However, 5 years on I re'r it as one of the most treasured and enriching experiences of my professional career. The stint made me see the human side of a corporate, that too as large as HUL. I was in an HUL factory in a small town. The factory had undertaken several projects for villages around it to help them build sustainable livelihood. One such project was the women empowerment project. In my stint too, I worked with some NGOs who worked towards starting cottage industries to be run by village women. These industries would capitalize on the strengths of these women - making pickles, or papad, sewing etc. Women formed self help groups and with the guidance of these NGOs were able to draw regular income. The NGOs guided them with procuring raw material and selling the product in the market etc. HUL factory would regularly take stock of this situation. Some self help groups supplied material to the HUL factory itself. Trainees were regularly a part of these projects. Such initiatives made me realise that being a large corporate comes with the added social responsibility. For the people who are coming from Rank, working in Rural is always a pleasure pressure. I too got an opportunity to work in the so called ‘media dark’ villages when I got an opportunity to roll our Project SHAKTI in Karnataka & Tamilnadu. We started the SHAKTI roll out in 2000 in AP with one district with handful of SHAKTI AMMAs but in 2002 it started getting into popular and exactly I joined with the SHAKTI team at that point and started the Karnataka roll out. There are 2 instances which I’ll never forget in my life. The first one is on social front. We appointed a SHAKTI AMMA in a village called Tiruvada Nallur and her name is Mrs. P Muthurani who hails from backward community. When I visited her village as Sales Officer of SHAKTI program I felt something uneasy and she too mentioned to me that in the last 2 months she was not able to sell anything because of the forward community people of the village have not bought anything from her. Then with the help of the Team Leader we conducted a health campaign in the village (Thyroid free check up) and given free treatment with the help of Thyrocare institute. This made the magic in that village and all the community people started looking Mrs. P Muthurani as a true savior who is going to develop the village in a big way. Once again after 2 months of the health camp, I visited the village and this time it was really a touching one for me because our SHAKTI AMMA started shedding tears and said that now ‘she got accepted from all the communities of the village and now she is entering into lot of houses which she never used to visit earlier’. It is not the money what they are earning through the SHAKTI program which is motivating them but like these small achievements only motivating them more. The other incident was a more interesting one. Usilampatti taluk in Madurai district is so much famous for female infanticide and during 1980s this female infanticide was a talk of the state. We got a good support from Indian Bank-Usilampatti branch and through them we have appointed lot of SHAKTI AMMAs. Like that we appointed Mrs. Chandra Devi who was the leader of Sanmathi SHG in Vaguruni village which had a population of 1800. Mrs. Chandra Devi is so powerful orator and she used to be front face lot of the initiatives of SHG movement in Usilampatti. Her husband got a post graduation and used to take tuition for the kids of the village without getting any money. Mrs. Chandra Devi got into SHAKTI program in the end of 2004 and she started doing a business of 15K per month with a earning of 1250. This was a big money for her at that point of time. During one of our initiatives to curb the local tea from rural (for most of the rural folks taking 5 times will be the food for the day and the tea which they are taking is the most adulterated one always) we did a awareness program and our then beverages SO Mr.Sundar VR also visited along with me to the village. During the interaction, Mr.Sundar felt quite amazed when the SHAKTI AMMA started using more phrases like “our Atta; our tea; our Clinic Plus; our Pepsodent” etc., and he informed the SHAKTI AMMA that he learned that day on treating the brands like our family members. Even today she is using this phrase only. In addition to this, she started building a small thatched roof house in her place and she informed all of us during a SHAKTI DAY function that she is going to name her house as SHAKTI HOME. She did the same thing when she completed the house and she called for a function and informed us too. It is quite clear that to win over rural folks, we must connect /engage with them emotionally and by bringing the required good things to them we can able to win over them fully. Was in Gujarat for a month. What stayed with me was the inequality in a part of the country which is definitely more affluent than others. So we stayed in absolute luxury compared to the others with access to television, to boot! But what hit hard was the other side. Whenever you moved to the other side of the village (Yes most villages have two sides - basis caste), you would see people queueing up at shops with 5 rupees in their hand with which they would buy everything apart from rice which could make their meal! and the money in their hand was all they had with them - their day's earnings basically. To know that a part of this country exists even in places which are better makes you realise how the majority of Indians are living. Not in urban centres drinking coffees but making enough money to be able to eat one meal. And then trying to sell shampoo at the lowest possible denomination of currency carries larger meaning. "3. Insights that fuel innovation are only generated when there is real intimacy with the consumer. By living with consumers, the quality of insights one can access is of a different order altogether." Could not agree more!! If i had to pick the biggest learning from my rural stint, it would have to be the above. The brief we (me and two other fellow BLTs) had was to come up with a plan of what all activities/ projects can to be taken up to help and better empower the community that we were part of for the duration of the stint. It dawned on us very quickly that walking around with a survey / questionnaire in an attempt to answer questions like "What do people need?" were completely ineffective. Instead, we spent days shadowing (literally, since we followed our volunteer members around all day) them, becoming their friend/ confidant, understanding who they are, what is their every day life like, what are their likes and dislikes etc. that really helped answer some of our questions. For e.g. one of the things that hit us was the realization that the daily meals of the local community consisted only of rice, potato, tomato and tamarind extracts with sometimes lentils becoming part of the meal (reason being the high cost of vegetables!). The under-nutrition report of the area that we examined later, said the same story! Being a farming community that lives on fertile land, we came up with a plan for expanding a kitchen garden facility where the front porch (or) back garden of the house was used to farm different vegetables - seasonal charts on what to farm in which month, tie up with NGOs for seeds and training etc followed. Without the benefit of having been able to spend a month in the rural stint, how else, could any of us (who have lived all our lives in metropolitan cities) have come up with such insights!! Stephen. Thank you for sharing a remarkable story on how to develop the heart of a leader - one that can build a bridge between business and society and work collaboratively with NGO's and locals to transform the way we work, think, and act. As we become experienced leaders we often lose the passion and heart that once compelled us become leaders. Has the company done any follow-up activities in this area, for middle or upper management, so as to not loose touch with the customer, market, and cultural norms that made the company what it is today? great refreshing way which helped me better understand why the training is important and instilled the humility and respect for customers in the trainees. Great research and writing Stephen. I have read you have worked in HUL for 10 years. How did it affect your leadership and leading skills?